This 3-stone ring sparkles with radiant poise and flawless craftsmanship. Made of rhodium plated fine 925 sterling silver. 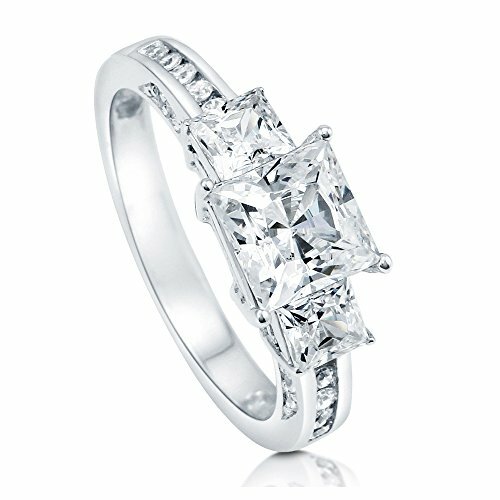 Features 1.59 carat princess cut clear cubic zirconia (6.5mm) in 4-prong setting. Accented with 1.05 ct.tw princess cut and round cut cubic zirconia in 2-prong and channel setting. Band measures 2.5mm in width. Imported. PREMIUM QUALITY STONE: Main Stone: 1.59 carat princess cut clear cubic zirconia (6.5mm), Side Stones: 0.78 carat princess cut clear cubic zirconia (4mm), Accent Stones: 0.27 carat cubic zirconia. STYLE: This 3-stone ring sparkles with radiant poise and flawless craftsmanship. STYLE: Engagement - Ideal for engagement, this ring will be perfect for your special one. Anniversary - This can be an anniversary ring to commemorate your journey. Promise - Sweet and sparkling, this style is an ideal promise ring for your girlfriend.